We spent last night at Glen Nevis SYHA in a bunk bed dorm. Fortunately it was quiet so neither of us had to play rock, paper, scissors for the top bunk. The hostel is large and clearly caters for vast numbers in the summer months. We were quite pleased that it was still out of season. Besides using the laundry facilities and a quick trip into Fort William, there was just enough time to take photos of the wonderful scenery, before trolling off to bed. It was grim. The rain came down so hard last night that I’m sure it dented the window glass. It wasn’t much better at first light either although the rain had eased a little. It was so dark that Jer spent part of breakfast putting new batteries into his bike lights for his journey. There was a real sense of trepidation from Jer this morning. The route is straight forward enough, not too many road choices to go wrong, but both the storms ahead and a notorious climb over Rannoch Moor unsettled him. We decided on a different strategy, one that would include more stops if needed. I was to set down every 10 miles and he would either stop if the climb was tough or shout out the number of extra miles he wanted to do as he was passing. We were set. The route today would take us down the A82 from Fort William to our stop at Ardlui. Heading out of Fort William, we crossed the bridge over Loch Leven hugging it’s southern shores before turning away inland towards Glen Coe and the mountains and moor beyond. Crianlarich would be first town out of the mountains and then a 17 mile descent to Ardlui alongside Loch Lomond. With the wind finally behind him he pushed on up to our stop at the pace he would expect on the flat. The obligatory cuppa had to be taken in the van this time as it was raining heavily. Jer was keen to get back out there despite the deluge and he took off. Soon the ground flattened and the valley gave way to a wider and wider expanse of craggy heathland. There was nothing stopping Jer now and he waved me past the 30 mile point. I stopped at the 36 mile marker at a fantastic scenic area overlooking Loch Tulla. What’s more it had a snack van! I took some video of Jer as he approached but he just waved me on again. He was clearly enjoying the ride despite the lashing rain and believe me, it was lashing. What I didn’t realise was that the wind had turned and was against him once more. He was only cycling on through bloody mindedness at this point. It poured. Even when he caught up with me at the 40 mile point, just before Bridge of Orchy, he wouldn’t dismount, and paused only to catch a bite to eat and drink before heading on, shouting skywards as he did so. I carried on to a point just before the 45 mile marker which was uphill most of the way. I knew this was going to be very hard, the rain was relentless now. He actually arrived quicker than I thought but was still very angry at the weather. Again, he didn’t want stop for long although he take some soup before setting off once more. We agreed to meet just before Crianlarich, 7 miles away. Fortunately most of this section was downhill with the wind behind him for most of it. The rain was still not letting up and when Jer arrived, he had become very despondent and full of self-doubt whether he could finish or not. Despite his work rate, he was getting cold and fatigued – the weather was taking it’s toll. Again he decided to push on for another 5 miles, there would be only 17 more today if he could summon it. At last the road was kind, if not the weather, and the long descent began to Ardlui. Jer forced himself on and I went on ahead of him just a few miles at a time. Each time he passed, I shouted the number of miles to go and with some shelter from the tress lining Loch Lomond, he pushed through to the finish line. After a change of dry clothes in the car park, which we nominated as our finish point, we drove to our hotel for the night, The Arrochar, just a couple of miles down the road. In all, Jer had cycled 68 atrocious miles in a little over 6 hours, finishing just before 2pm. 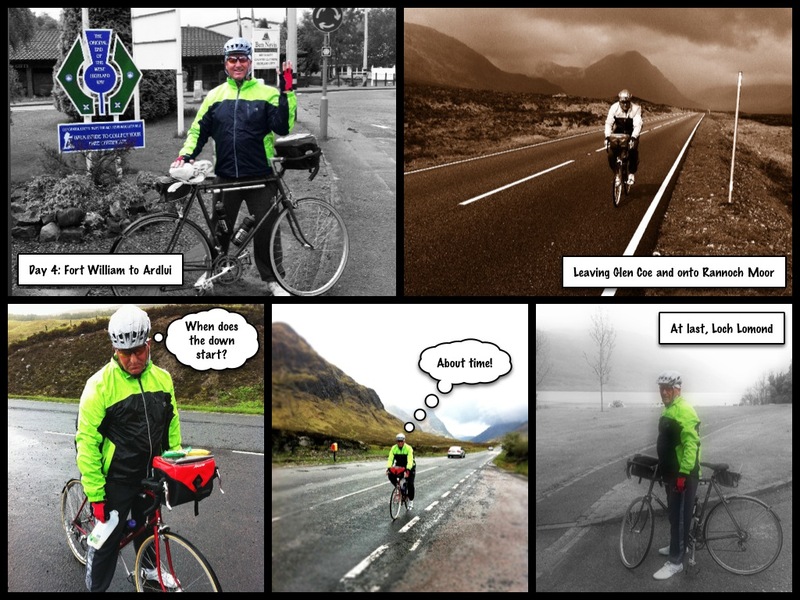 Time for a rest and then work on how to circumnavigate Glasgow tomorrow…. As for Jer’s spirits, a hot bath and lunch in a local bar overlooking a now sunny Loch Lomond seems to have done him the power of good and he’s back on form And looking forward to the next challenge in the morning.